The super-styled beard is the latest style trend to grace the faces of the male population, in varying degrees of fuzziness, and with that comes a veritable host of treats for the face, beard, moustache and more. But, finding the right products that works for you can be tricky, and ending up all red and bumpy from a dodgy razor is never fun for anyone, so make sure you invest in a product that is designed for the area you’re looking to groom. Anyone looking to tame unwanted facial hair like the odd stray nose or ear hair (yes, we feel your pain), keep your eyes peeled for the best face trimmers designed for those hard to reach areas, Philips and Panasonic frequently offer great deals on their trimmers and shavers so are worth keeping and eye out for. If it's a full head shave that features in your grooming regime, a wet and dry electric shaver will be your trusted companion - just be sure to opt for a cordless one if you want to avoid the frustration of the cable not quite reaching all the way round your head. We have rounded up our favourites below plus the best deals from popular retailers to save you the hassle. If you are of old-fashioned persuasion, you'll be pleased to hear that traditional male grooming products are back by popular demand: traditional straight razors can be tricky to master (and come with the obvious safety warnings!) 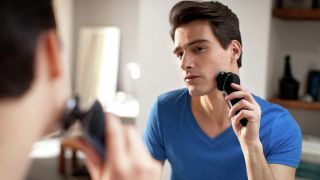 but they do give a much closer, sharper shave, something to think about if you are the type of guy that allows a bit of time for your morning routine. Traditional beard grooming kits are also on the rise, so if you are planning a seriously preened Movember moustache, you might want to invest early and get combing! Take a look through our pick of the best beard oils if you are after a conditioning finish. Using the right skincare products as part of your routine can make all the difference, so making sure you cleanse and moisturise before and after shaving is essential for achieving silky smooth skin. It might feel like overkill to consider high end, designer skincare products, but brands such as Tom Ford are a dab hand at combining luxury skincare ingredients and signature scents so you really do get more for your money. We’ve rounded up all the best male grooming products you need to complete your very own kit, so whether you’re starting from scratch or looking to try out some new products, these products will help you tame the mane. If you shave every day, then the Philips Series 9000 shaver might be a good investment for you. It’s cordless, so you’re not restricted to standing in front of the mirror while you shave, and it’s 100% waterproof which means you can even use it while in the shower. Use it with shaving foam or dry if you’re in a hurry, and its cordless body makes it easy to take away on trips for a quick and close shave wherever you are. The battery lasts for up to 50 minutes which is great, but the charging station is a bit bulky so you’ll need to make room on your bathroom ledge so you can always be prepared. Overall, we think this is one of the best male grooming products 2018 has to offer to keep that beard at bay. This beard grooming kit would make a great gift for anyone you know who’s precious about their beard, or if you’re looking for a new way to tackle the beardruff (yes, it’s a word), then these all natural products could work for you. You get wax, balm and oil to make sure your facial hair is smooth and soft, and a handy comb and scissors for when things start to get a bit wild. Customers love this gift set, but say they’d have liked larger products. However, the handy travel sized items would be great for taking on holiday with you or chucking in your gym bag. If you've ever been to a barbers and has the full experience of a close shave and hot towel, you'll probably agree that by the time you get home and return to your standard 'basic razor' routine, it can feel a bit underwhelming. If you are feeling brave enough, it is possible to bring this traditional barber treatment to your very own bathroom. Yes this Böker Razor is pricey, but if you are after a classic shave and have the time to master the art, it could well be a worthy investment. A straight razor reportedly provides a much closer shave than an electric one, so if clean cut and sharp is your style, it's worth a punt. If you’re often on the go, that’s no excuse to let yourself (or your beard) go. Enter the wash bag. If you are looking for a mens toiletries bag to store your best-loved skincare products, Ted Baker have come up trumps with this Carmore Washbag. The denim-effect outer with leather detailing places this wash bag firmly in the smart-casual category making it pretty perfect for the gym, work trips and spontaneous adventures. A hidden interior pocket is a handy added extra, particularly if you travel with tweezers or other smaller accessories that you want to keep separate from your wash kit. Plus, this bag comes with a geometric print travel towel, gym bunnies take note. Have you painstakingly tried to pluck those annoying stray hairs you keep finding? You may find that a trimmer is quicker and easier in helping you tidy up those tricky areas. This ear and nose trimmer is small and compact, which could make for a handy little gadget to keep in your wash bag in an emergency, and it’s a bargain. Users thought the blade could be a little sharper for more precision, but overall found it to be very effective on stray nose hairs. It comes with a protective cap so you won’t nick your fingers or get the blade jammed with dirt when you pop it in your bag. Shaving can really take its toll on your skin. It dries it out and can leave you with shaving rash/burn that consists of unsightly red lumps and bumps. However, using a moisturiser will help combat this problem, so if you find you have particularly dry skin, you might want to try this Tom Ford Aftershave balm. Not only does it aim to soothe and hydrate, it’s made with a woody/musky scent that should leave you feeling and smelling irresistible. It might seem pricey for a moisturiser, but you’re basically getting a moisturiser and a fragrance all in one, which makes it totally worth it. With male grooming, it’s best to get into a routine of cleansing and moisturising to help keep your skin soft and looking young. If the Tom Ford aftershave balm is a little out of your price range, then this Bulldog Skincare kit might be more up your street. The set contains both a face wash and moisturiser which are packed with natural ingredients such as aloe vera, camelina oil and green tea which aim to wake up the skin and keep it looking fresh. With an absence of artificial ingredients or fragrances, any guys out there looking for skincare products that are gentle on the face, this Bulldog kit is a purse-friendly, face-friendly option. Picking the right hair product can genuinely be a daunting task, with the volume of hair gel, hair wax, hair putty, hairspray products on the market - it is effectively trial and error until you find the perfect fit. But, Vo5 have made it easier for guys with mid-length who don't like gel with their Extreme Style Matt Paste. For anyone who likes the idea of a tousled, 'controlled mess' look, this might just be your perfect hair product. The ingredients make for a non-shiny formula with a matt finish that aims to last all day, plus, it's re-workable so if you are a trial and error type of guy, you won't need to wash this out to re-style.